RBTH catches up with American ballet dancer David Hallberg who joined the Bolshoi Ballet as a principal last summer and shared his experience. Hallberg, 29, is on a remarkable journey, one that has already taken him from South Dakota to New York and now to Russia, where he is the first American to make his debut as a principal dancer with the Bolshoi Ballet in Moscow. 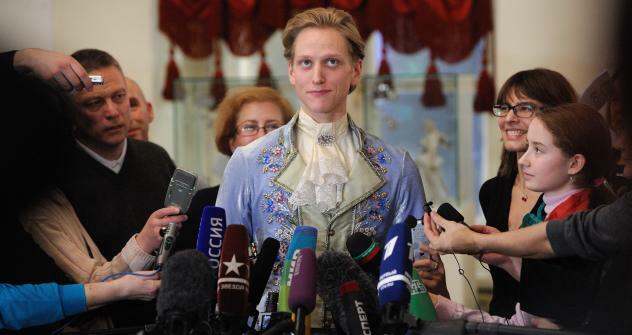 Hallberg speaks of his transition to Russia and his ambitions at the Bolshoi Ballet. Russia Beyond the Headlines: How did you start ballet and at what point did you know you wanted to be a professional dancer? D.H.: I started ballet after seeing Fred Astaire. He was my first inspiration. But I came into ballet quite late. At 13. Before that was tap and jazz. Ballet was my true calling though. RBTH: Can you talk about your decision to leave the American Ballet Theatre and join the Bolshoi Ballet? D.H.: I have not left ABT. I am just splitting my time now. I will be 50/50 in both companies. This was very important to me as I am still very happy at ABT, but it is the true definition of an artist searching for more. Sergei Filin was very respectful of my staying at ABT and never asked me to leave the company altogether. But the Bolshoi offered something like I have never experienced before. It is so different from ABT. The culture, traditions, everything. RBTH: What has the transition been like from New York to Russia? Has it been challenging to adjust to Moscow? Do you feel welcomed by the dancers and the company? D.H.: The transition was hard and still poses certain challenges. I do not yet speak the language and that seems to be the hardest thing to grasp. Moscow is so different from New York. I mostly work here, and don’t have much of a social life. But I am enjoying the difference in life style. In New York City, I am so social and so busy, with so many friends to see, and things to watch. In Moscow, for the time being, it is mainly work and rest. The company has been very warm and welcoming. I was quite surprised. I expected something so different. But that was not the case at all. RBTH: You have had extreme success in the United States. The pressure is, of course, quite large now for you at the Bolshoi. What is helping you get through it? D.H.: A sense of perspective! And the knowledge that Sergei Filin and Mr. Iksanov of the Bolshoi Theatre asked me to come to the company for a reason. So I just have to do what I have done for ten years, and hopefully better! RBTH: How is it communicating with your partners during rehearsal? Do you find yourself lost in translation? D.H.: Sometimes. But dance is a universal art form. We speak the same language. We don't have to open our mouths and communicate verbally. We just have to dance together. RBTH: You have been at the Bolshoi for several months now, how do you think you've been influenced so far? D.H.: I have been influenced by my coach, who looks after me with every detail. I wanted to experience the style of the Bolshoi dancer, and see what can work for me. And he is seeing to that. His name is Sasha Vetrov. RBTH: You have danced all the major leading roles in the classical repertoire. Do you have a favorite? D.H.: Giselle. Romeo when my Juliet and I are connected. RBTH: Which ballet do you hope to be cast in soon? D.H.: New Ballets. That is my main search right now. An artist has to keep searching and questioning. I cannot question Swan Lake forever. RBTH: Will you be working with one specific partner or will they be rotating? Is there a partner who you want to dance with? D.H.: I dance mainly with Svetlana Zakharova, but also with Lunkina and others. I will [dance with] almost every main ballerina and hopefully some that are coming up as well. RBTH: The ABT and Bolshoi styles are quite different. Can you talk about the adjustment? Also, can you touch on the differences in the day to day - from class to rehearsal? D.H.: The rehearsal day is what was most different. At ABT we rehearse for six hours a day sometimes. This is so exhausting but you learn to manage your time and energy. At the Bolshoi I have about two hours a day, but it is very intense. We do so much in two hours that I am exhausted and need to rest for the remainder of the day! RBTH: A ballet dancer's life can be quite isolated, particularly when you move to a new country and need to establish your social base. How do you stay balanced? Staying in tune with other interests. Reading, writing, examining other forms for art (visual, film). An artistic balance. RBTH: What are hoping to accomplish during your time with the Bolshoi? It is all about the learning process for me. I want to learn as much as I can, about the theatre, traditions, style. Then I will be a richer person and artist.